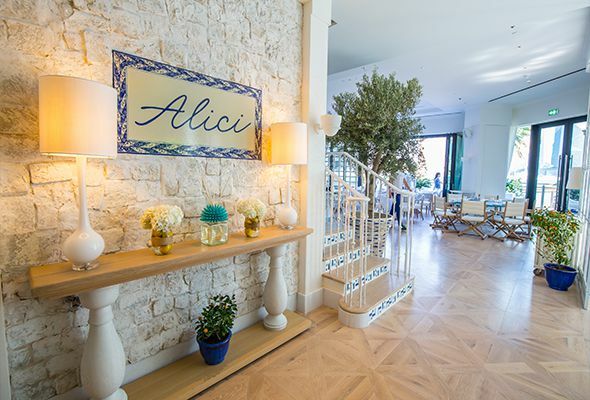 We had high expectations for Alici, the homegrown restaurant from the team behind two-time What’s On Restaurant of the Year award-winner, Il Borro Tuscan Bistro. And if first impressions count, boy, did Alici deliver the goods. The Amalfi coast-inspired restaurant is located on the waterfront of Bluewaters island, and walking inside feels like stepping into a cosy family-run trattoria on the Italian coast. Everything inside Alici – which means anchovy in Italian – is beautiful. Contemporary cream interiors are blissfully interrupted by art and pottery, most of which has been hand painted by ‘The Anchovy Man’, famed in Italy for his fish paintings. The two-storey restaurant is split into an intimate restaurant space with a raw bar downstairs, and a livelier upstairs where you’ll find an inviting bar, private dining area and partially open-plan kitchen, where you can just see in to watch chefs at work as you pass by. 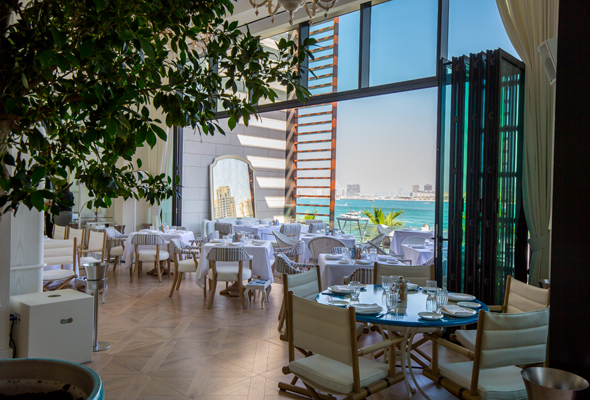 Both floors open up to terraces, with the ground floor terrace lined with flowers native to the Amalfi Coast, and the upper outdoor area offering stunning views towards the twinkling Dubai Marina skyline. It’s the only reminder you’ll get that you haven’t left Dubai for the glittering waters of the southern Italian coast. The menu is extensive but not overbearing, and a friendly waiter guides us through it, confidently recommending his favourite dishes while ensuring we don’t over order. We opt for the ricciola (Dhs65) from the crudo bar, and watch in awe as a swift team of chefs glide delicate slices of amberjack onto a plate, dressing it with pomegranate, thin cuts of apple and drizzle it with lemon. It tastes as delicious as it looks, and the freshest of fish is complimented by the citrusy taste of the fruits. The tartare di manzo con artufo nero (Dhs145) is Alici’s take on a beef tartare. Another beautifully presented dish, once tossed together it’s a brilliant flavour combination of gamey beef tenderloin, pickles, quail egg, homemade mustard and fresh black truffle. We order the fritto misto (Dhs95) for the calamari, but enjoy the crispy slithers of fried zucchini and purple potato dunked in citrus mayo just as much as the fresh squid and prawns. Lightly battered and fried, they’re served alongside the citrus mayo and a thick, punchy chili jam. For mains, the highlight is the capesante scottate (Dhs170). Another signature dish, hand dived scallops are lightly seared and perfectly plated with roasted cauliflowers, crispy beef bacon and wild mushrooms. The soft textures of the scallops combined with the crunch of the cauliflower and bacon make for a rich, flavourful taste explosion, and we struggle to refrain from licking the plate clean. For dessert, the torta al formaggio (Dhs50) is the prettiest plate we see come down from the kitchen. 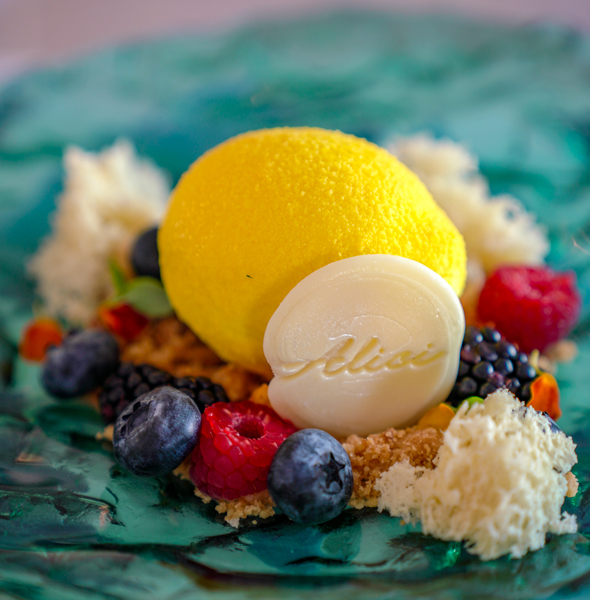 A citrus sensation, the lemon cheesecake is shaped to look like a just-picked lemon, and plated with wild berries and almond soil. Don’t leave without trying the mandarin soufflé (Dhs55) for dessert. Cooked to perfection with that just-risen top, it’s a fruity finish to a faultless dining experience.